So what IS the Greatest American Rock Band? The more I ponder this question the more I come to the conclusion that the best answer is most likely the original incarnation of Van Halen from 1978 - 1984. They had everything you could want in a rock and roll band. David Lee Roth was the best entertainer and front man and at the time he could really sing well too, Edward Van Halen was groundbreaking, influential and insanely good as a lead player, a rhythm player and as a riff writer as well as a good harmony vocalist, Michael Anthony was as solid a bass player as they come and was arguably the best harmony vocalist in any American rock and roll band and Alex Van Halen could rock and could roll with the best swing and killer chops of any American rock and roll drummer I can think of. As good as they were as individuals, the sum of their parts were even better. And caught Diamond Dave about 10 years ago. The man does not disappoint. His stage banter alone is worth the price of admission. I’ve never been one to much concern myself with other people’s musical preferences. Coincidentally, I like the Eagles and I think they’re the strongest contender for the title. I figure its either them or the Beach Boys. Van Halen is the greatest Dutch rock band. You realize that it's all just a matter of personal taste. It'd be boring any other way. OK, if not the JHE, then how about the 1910 Fruit Gum Company? Now that's some subversive s&^%$#. The greatest American Band is Australian. Dr.Teeth and The Electric Mayhem. Also the greatest Indonesian rock band. Eddie with the encouragement of his Indonesian mommy. I tried to follow EVHs path. But failed. Must be more to it than just the guitar. The greatest Indonesian rock band was the Tielman Brothers. It's a long thread, but assuming no one before me has mentioned it. For over 50 years Bob Seger and the Silver Bullet Band have been rocking America. There are so many of their songs that when you hear you have instant recognition and a memory. Just heard something relevant to this thread maybe some of you all find interesting. This is an interview with Benmont Tench (of Tom Petty & the Heartbreakers) about the Beatles and related topics. Toward the end he says the British bands had better bass & drum combos. The best US rhythm sections were, he says, not in bands but in recording studios. Interesting interview - he's a thoughtful guy. 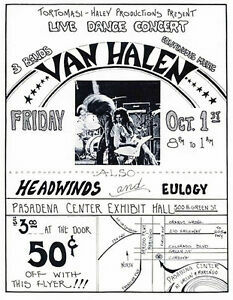 Regardless of where the band members were born Van Halen came together in Pasadena, CA, USA. Van Halen is a good choice, too. Being out East, and how Regional Radio and the Music Distribution Industry were at the time, they did well in Philly getting started. So, when does Michael Anthony make it back on Stage for a proper Reunion Tour? I can’t imagine Wolfgang Van Halen is going anywhere. I believe that ship has sailed. i mean, i like the Ramones, but i guess i never got the joke. to me they're amusing for a bunch of glue-huffers from Queens, but not really compelling in any sense. they're kind of the clown car of rock. No offense to hard-core fans of the Ramones but I've always seen them just as macphisto describes. I didn't look at the link but The Wrecking Crew certainly came to mind. They are more Beach Boys than the Beach Boys and many others. Of all that were mentioned, Bruce and E-Street are my hands-down favorite. BUT.... for what I consider all of the criteria that has been mentioned and insinuated, I have to choose the Rolling Stones. Skynyrd and TP and the HB are pretty high too. ......But then I might have to put Metallica in before them and maybe Van Halen as #2. Lotsa great R & R!